The original Sunbeam company was founded by John Marston in 1899 and based in Wolverhampton. Its position in the market was akin to the present day Jaguar. 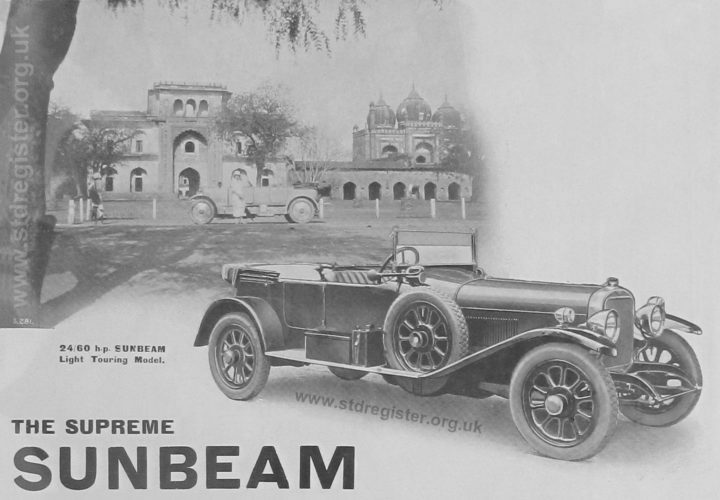 Sunbeam was one of the premier marques of British car achieving its peak of fame during the 1920s. It first came to prominence following the appointment of Louis Coatalen as chief engineer in 1909 and Coatalen designed cars were soon setting new records of all types at Brooklands race track in Surrey. In 1912 the 3 litre Sunbeams caused a sensation when they came 1st, 2nd and 3rd in Coupe de l’Auto for touring cars run at Dieppe. So good were they, that they achieved 3rd, 4th, and 5th places in the French Grand Prix run concurrently! The cars which came 1st and 2nd achieved their places with engines which were 3 and 5 times the size of the Sunbeams! The almost identical touring model sold very well as a result. The Sunbeam Car and Sunbeam-Coatalen Aircraft Engines. 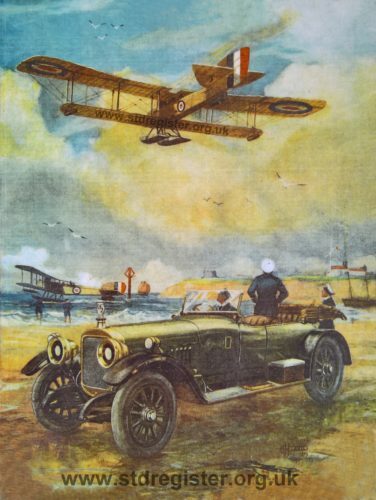 In 1917, with the Great War still raging, a 24hp Sunbeam has brought these naval officers to watch seaplanes powered by Sunbeam-Coatalen aero engines. – The artist, GH Davis, was well known for his military paintings. See here for some more examples. In a famous race against Bugattis and Fiats, among others, Sunbeams came 1st, 2nd and 4th in the 1923 French Grand Prix and won the Spanish Grand Prix the following year. 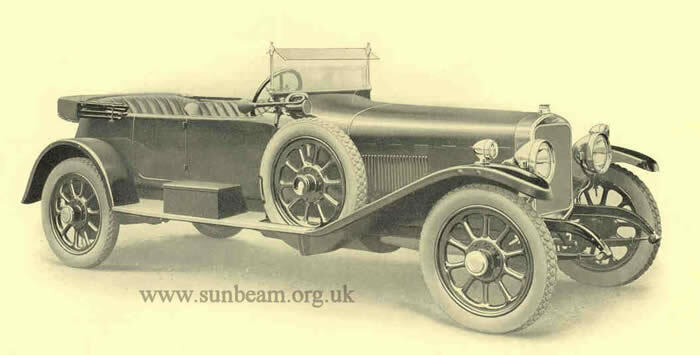 Sunbeam was the only British make to win a Grand Prix in the first half of the 20th century. 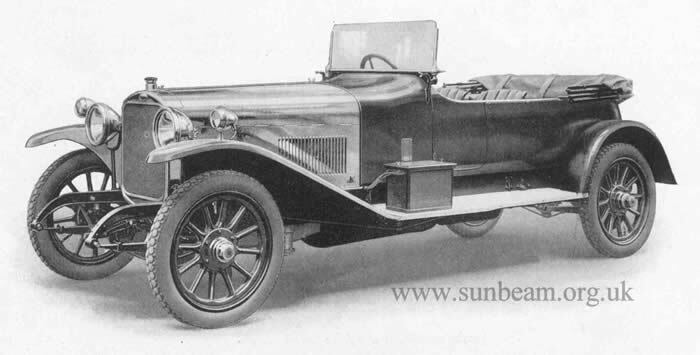 Many of the features taken for granted on modern cars were first developed and tested by Sunbeam on the race track and then introduced to their ordinary touring cars. Among features pioneered by Sunbeam were overhead valve engines, brakes on all four wheels, power assisted brakes and twin overhead camshaft engines. Twin cam engines were standard on the 3 litre Super Sports models from 1924. Sunbeam also held the world land speed record on several occasions as commemorated on British stamps issued in 1998. Malcolm Campbell’s first “Bluebird” was a Sunbeam and in 1924 he achieved 146mph on an 18 litre 12 cyl Sunbeam developing 350hp. He had achieved the same speed a year earlier but the timing equipment had not been approved. In 1925 he was the first to reach 150mph on a similar car. “The most improved cars of 1922” This is the considered judgement of those who have tried the present type of 16/40 h.p. and 24/60 h.p. Models. And is largely due to the entirely new OVERHEAD VALVE ENGINES with which these Cars are now fitted. The photograph above shows a Sunbeam 24/60 Light Touring Model in front of the palace in Kapurthala, India, a small, but very well run, native princely state within Punjab Province. A 16hp Sunbeam may be seen in the background. In 1926 Maj. Henry Segrave beat this on a new 4 litre 12 cyl Sunbeam when he reached 152 mph. The final triumph came in 1927 when Major Segrave, driving a twin engined 1000 hp Sunbeam, again broke the World’s Record with a speed over 200mph for the first time. 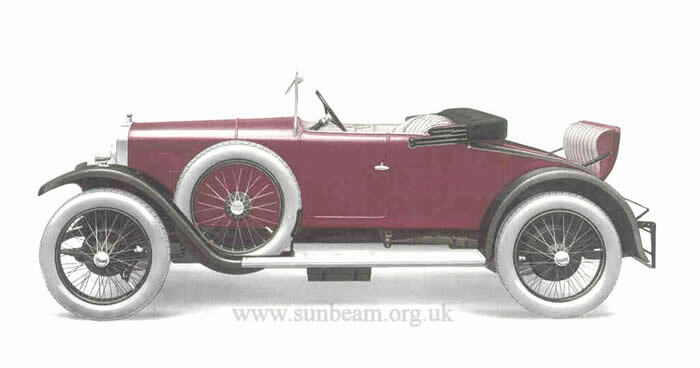 In 1925 Sunbeam entered the new 3 litre Super Sports car for the Grand Prix d’Endurance (24 hours) at Le Mans. 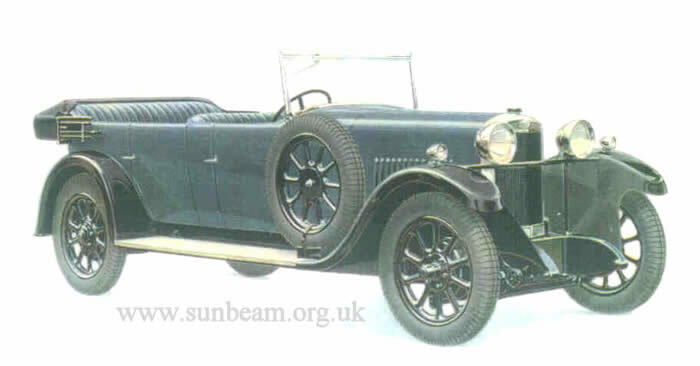 Sunbeam was the only British make to finish and won 2nd place overall and came first in its 3 litre class. Trading in the Talbot at the Pass & Joyce showrooms. A prospective client considering the merits of a 1929 Sunbeam 16. 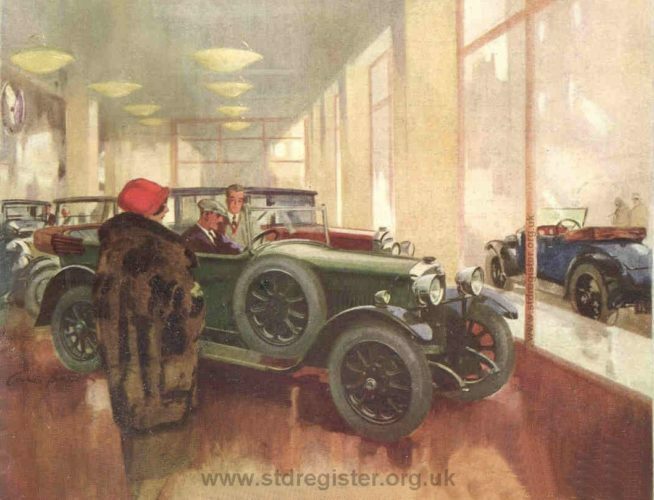 The STD Group, which came about with the merger of Sunbeam with Talbot-Darracq in 1920, was in fact badly mismanaged. It failed to rationalise its model range so that, at double the development cost, its own cars were often competing against each other for sales. The Sunbeam 16 and Talbot 14/45 for example were fairly similar cars aimed at the same market. Not only this, but there was virtually no standardisation or interchangeability of parts within the group which would have reduced costs. From about 1927 Coatalen spent most of his time in France and Sunbeam innovation more or less ceased. 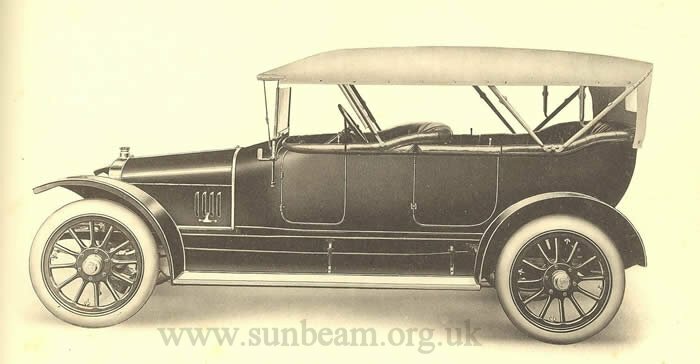 Sunbeam which had been the saviour of the Talbot company hitherto, now increasingly depended on the success of the Roesch Talbots. Following the Wall Street Crash of 1929, the depression of the 1930s set in and when in 1935 a large loan, taken out ten years earlier, could not be repaid, STD Motors went into receivership. The Rootes Group outbid the fledgling Jaguar company and bought Sunbeam and also Talbot. Both plants were closed and Rootes merely used the name to sell cheaper, badge engineered Hillmans. The Sunbeam-Talbot name was nevertheless to achieve much success in the 1950s & 60s in its new guise. 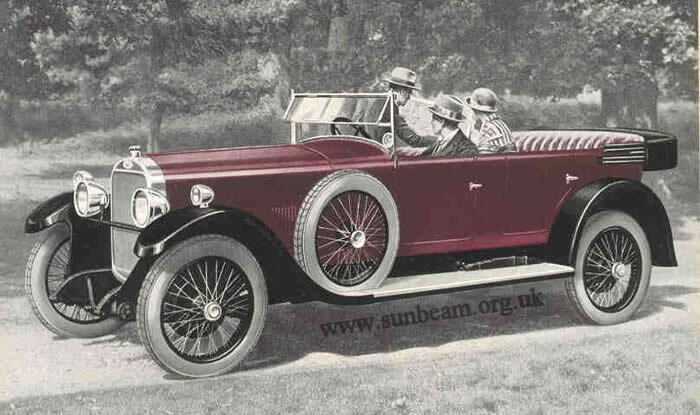 For those who would like a little more information on Sunbeam cars, and the company which built them, please refer to this excellent page from the Wolverhampton History & Heritage Website or else for more specific information contact site author Colin Weyer using the form on the Contact page. Some examples of Sunbeam touring cars are shown below (click on images for a closer view). 1920 Sunbeam 24 hp Four seater semi-sporting model. Engine 6 cyl. side valve 4524 cc. Footbrake on rear transmission and handbrake on rear wheeels Fitted with electric self starter & lighting set. 1922 Sunbeam 16/40hp The 4 cylinder 3016cc overhead valve engine on this model replaced the previous side valve engine which had been fitted hitherto. 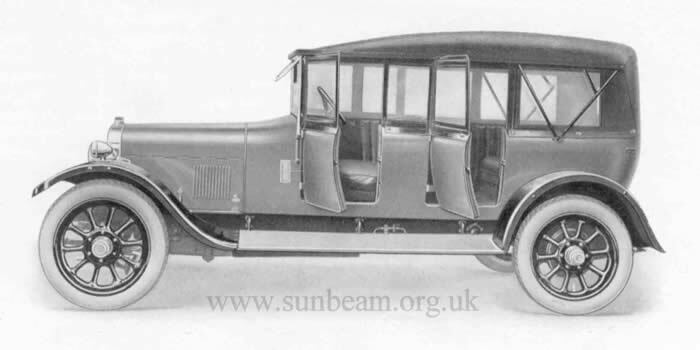 1922 model 24/60 hp 6 Cylinder Sunbeam with 4-seater Light Touring Body 4524 cc overhead valve engine running in seven bearings Capable of 70 mph. 1923 Sunbeam 16/40hp This photograph shows a typical Sunbeam touring car with hood erected and side curtains in place. 1925 Sunbeam 14/40hp 2 seater touring car with double dickie seat. It had a 2.1 litre 4 cyl ohv engine. As with all Sunbeams of this period, the 14/40 was also available with standard 4 door open and closed coachwork. 1925 Sunbeam 20/60hp Engine: 6 cyl ohv 3180 cc. This car was highly acclaimed in the motoring press of the day for its refinement and advanced features. It is capable of 70mph. The chassis is fitted with Sunbeam 4 wheel brakes. 1926 Sunbeam 3 litre Super Sports Car Engine: 2916cc 6 cyl Twin Overhead Camshaft Capable of over 90mph and fitted with servo assisted brakes on all four wheels. 1929 Sunbeam 16hp This 2040cc 6 cylinder car was one of the most popular produced at Wolverhampton. It had a top speed of over 60mph and 4 wheel brakes were of course a standard fitment. Almost the end of the road: the Sunbeam “Twenty-one Sports” Coupé as featured in the 1935 catalogue. A car of exceptional performance and outstanding appearance. Here are some famous racing Sunbeams, with commentary, filmed at Coys Centenary Exhibition in 1999. Louis Coatalen became Sunbeam’s Chief Engineer in 1909. He was a motor racing devotee who initially raced his own cars and later, after he became a company director, just designed a whole series of record breaking cars.